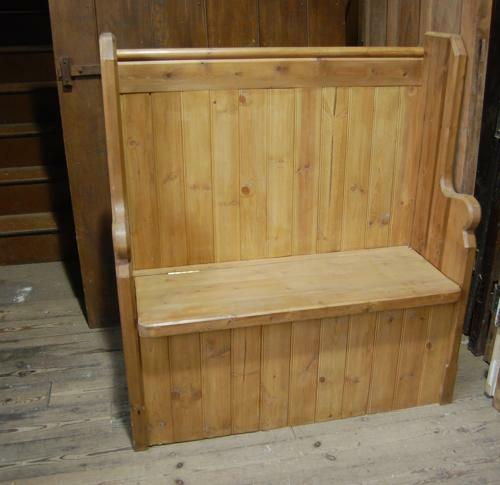 A fantastic and imposing pine church style box pew/ bench. The pew is of a Gothic style and has attractively carved arms. The back and seat front is planked and the seat lifts to create a large storage box. The pew is very large and solid and the item is well made. The pew has a lovely colour and attractive wood knots. The seat has hinges making the seat lift easily to access the storage. The pew would fit well with a rustic interior and could be used at a kitchen table or against a wall in a hall or dining room. The pew would be best against a wall as the back is not planked. There is a very small amount of damage to the bottom of the right hand leg and there are some small nail holes in the seat back but the pew is in otherwise great condition. A lovely and useful item that would add great style to a home or cafe.